International media were banned from reporting on protests in June, so pictures on Twitter filled the gap. They called it the "Twitter revolution". Iran's post-election protests showed the world the power of new media to organise and publicise opposition in a controlled society. On the anniversary of the Islamic revolution in 1979, once again Twitter, Facebook and other internet tools could be crucial in helping the opposition organise another major protest. Since Iran's disputed election in June of last year, the cyber war between government and opposition has taken on a whole new dimension. His webcast is broadcast on YouTube, and his staff say it then goes "viral" - spread across Iran by other websites, CDs and Bluetooth links between mobile phones. Mr Dabashi described the role of the internet in helping to organise the huge post-election demonstrations. "Nobody called for it except on the internet," he said. "Cyberspace was buzzing with information that there was to be a demonstration from this square to that square. As a result if there is a leadership... it is really the networking that the internet has made possible." Just over a week after the election, the footage of a young woman, Neda Agha Soltan, bleeding to death from bullet wounds was sent from a mobile phone and relayed around the world. The opposition believes she was shot by one of the government's Basij militia. The Iranian government continues to deny responsibility, but the pictures have swayed opinion internationally. That raw power has been noticed by governments. The US Secretary of State, Hillary Clinton, hosted a conference recently on it in Washington and proposed new support to try to free the internet from censorship. The Iranian government has become far more sophisticated in its handling of the internet as well. A day after the election, Iran closed the internet down entirely for half an hour, then slowly loosened its grip, as the authorities struggled to gain control. "If you look at what was going on after the election, it was very clear that they had no solid plan in place," explained Austin Heap of the Censorship Research Center in San Francisco. "The way they were filtering, what they were filtering. Just basic things like the speed the internet was operating at would change day by day, week by week. And if you look at just the past three months their filtering attempts have become more co-ordinated and organised." Mr Heap has been writing an anti-censorship program, Haystack, which he hopes to spread to internet users in Iran. 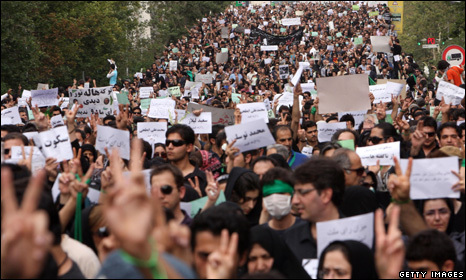 My experience from two years in Iran was that both sides struggled to gain the upper hand. Any program to prevent filtering would have a limited life, as the government eventually found a way to block it. But at the same time the filtering system was crude and ineffective. In the turmoil that followed the election, that "mood swing" became even more dramatic. One morning the whole BBC website would be inaccessible, and even usually secure connections were blocked. On other days the controls would be mysteriously lifted, enabling us to use the internet to broadcast live from our office in Tehran. 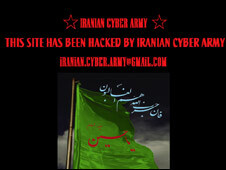 Now Iran says it has organized a new "cyber army" with a more sophisticated approach. According to experts I spoke to in the United States, the Revolutionary Guards have drafted, sometimes against their will, some of Iran's bright young internet-savvy generation. Not only are they helping to block opposition communications and track down opposition supporters from their use of the web, they have taken the battle to the enemy. The cyber army claimed responsibility recently for what Mr Heap said was a well co-ordinated attack on Twitter and other websites. "The attacks were very well organised," he told me. "They had back-up plans and back-up back-up plans, all of which got enacted. It was clear with the timing and the co-ordination that people had planned this ahead and were trying to make a statement." The battle for control of the web is carried out between governments and individuals. Each new censorship tool used by Iran or other authoritarian countries is taken up as a challenge by many thousands of young computer experts around the world. It is a game of cat and mouse, likely to change the face of the internet for the indefinite future. Cyber battle has become cyber war, and there is no sign of a ceasefire. Jon Leyne is the BBC's Tehran correspondent. 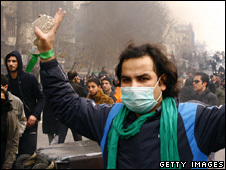 He is reporting from London after being forced to leave by the Iranian government for reporting on protests in June 2009.